When it comes to children’s bikes, most are constructed with heavy frames and components but Giant chose to buck this trend. Their brand new ARX 2019 kids bikes are constructed to be lighter and quicker for your little ones! What makes the ARX range so special? The ARX range has been designed to be faster, lighter, and so much more fun for kids to ride! Perfect for their first bike or an upgrade for when they grow both in height and confidence. The frame and fork are constructed from ALUXX aluminium, making the ARX the lightest in its category! The Giant ARX features a lower bottom bracket, this means added stability which is great for kids who are learning to ride. The ARX 16 is designed as a first bike, with a lower top tube this bike is fantastic for the little ones and boosting their confidence on two wheels. The 16 has single speed gearing, ideal for learning to cycle and riding to the park. The ARX 20 features a downward sloping top tube, providing the next step up for your kids. This bike is ideal for those who have good ability and confidence on the bike. 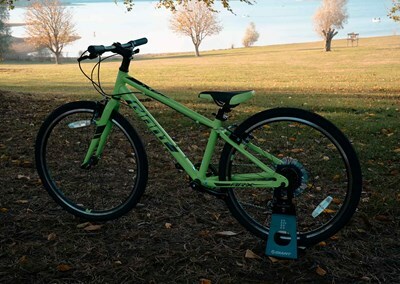 The 20 comes with 8 gears meaning your kids can ride further and faster, great for taking your bikes to a local forest or trail! Finally, the ARX 24 is the last model in the range and is built for adventure! With 8 gears and larger wheels your kids are ready to tackle whatever comes their way as they begin exploring by bike. The tyres on the ARX range are versatile, meaning your kids can ride along paths, rough roads, and even venture into the mud and dirt. The frame features lightweight components that are sized specifically for younger riders meaning your kids will love every second they are in the saddle. When it comes to colour choice, Giant have created the ARX range in 5 different colours; red, orange, yellow, blue, and green. With all this choice, you are guaranteed to find the bike of their dreams. It can be difficult to know what size bike your child needs and how long before they outgrow it. If you are unsure then pop into either our Giant Store Rutland or Giant Store Cambridge and speak to our experts to find the right bike for your child. Come in store to either our Giant Store Cambridge or Giant Store Rutland to see the full range of Giant ARX 2019 kids bikes.